S Walker Transport provides a range of next day and economy nationwide delivery options for palletised goods. We can move anything from a single pallet through to a full load, providing a complete solution for your istribution needs. At S Walker Transport we are part of national network, UK Pallets which more then 80 disribution members working together to cover your pallet needs. we operate out of our site in Redditch, we deliver/Collect from all B Postcodes and WR. 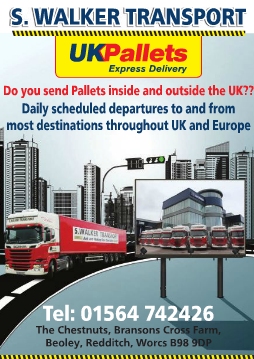 we collect pallets daily and sending the overnight to UK Pallets central Hub in Litchfield. All details of the pallets are checked, scanned and verified before being sent out for delivery.